I was sleeping. Soundly. And then my pregnant wife shook me awake. “I think the baby’s coming,” she told me. It was four in the morning. God bless my wife, she actually tried to go back to bed. But my little unborn daughter had her own ideas. Believe me when I say, that wouldn’t be the last time. But as I looked down at my beautiful, teeny, amazing daughter…c’mon… No way was I ever letting her out of my sight. Thankfully, the nurses put up with me, and let me pretend I was some old parental veteran as I helped give my daughter her first bath. I still remember all the dreams I was dreaming for her as, later, I sat rocking her and holding her close. I didn’t want just one thing for my daughter. I wanted everything. If she needed strength, I wanted her to be strong. If she saw someone hurting, I wanted her to find the compassion to help. If there was a problem, big or small, that no one could solve, I wanted her to have every available skill – ingenuity, empathy, creativity, perseverance -so she could attack that problem in a way that no one else on this entire planet had ever fathomed. And that would be her greatest gift: That no one – and I mean no one -would ever be exactly like my Lila. Thankfully, during her first few years, I realized my clichéd, self-important plan was just that. It hit me after hearing the stories of heroes like Sally Ride. Sure, I knew she was the first American woman to travel into space. But at a time when there were no women astronauts, do you know why NASA chose her? Some say it was because she was a genius at physics…or that it was her physical resolve and athletic ability…or that she was simply fearless. And sure, it was probably all those things. But it was also because, when she saw an ad in her college’s newspaper looking for female astronauts, Sally Ride saw an opportunity. And grabbed it. In that moment, she dared to attempt what no woman had done before. I love that story. I wanted you to hear that story. I wanted your brothers to hear that story. I wanted everyone in this world to know that if you take a chance…and work hard…you can do anything in this world. Following birth order, I first wrote Heroes for My Son, which was published two years ago. At the time, I was simultaneously writing the book for my daughter – and not just because my daughter kept coming up to my office and demanding, “Where’s my book?” (which she did). Over the past six years, as I began my collection of heroes, I always knew I’d have to split them between a book for my sons and a book for my daughter. Think I’m nuts? Wait till you have more than one kid. Like Switzerland, my parental goal was to keep all parties neutral, so all my children would feel equal love, equal respect, equal life lessons. Am I insane? I have three kids. Of course I’m insane. But (to steal my mother’s phrase), for those three little blessings, I’d saw off my own arm. And so, feeling like a 21st-century parent (so progressive I couldn’t even see – much less acknowledge – gender differences), I began to write these two equal books filled with equally amazing heroes. That word? Fighter. By my editor’s count, fourteen of the fifty profiles had the word “fight” or “fighter” in it. As she pointed out, “Some of them, like Abigail Adams, Winston Churchill, Hannah Senesh, Thurgood Marshall, were literally fighters, so of course the term should stay there.” But I also used it with Audrey Hepburn, Helen Keller, Teddy Roosevelt, Nancy Brinker—even with Lisa Simpson and the Dalai Lama. The Dalai Lama! Even in the pacifist, I sought a fighter. And yes, that probably highlights my lack of descriptive ability. But it also raises a vital question. Why? After years of trying to keep this book for my daughter perfectly equal to the book for my sons – after years of trying to teach them the exact same lessons – why did I focus so intently on making sure that my daughter knew how to fight? Why did I keep using that word? Why, subconsciously or not, was that the lesson I kept coming back to? I’m okay! I’m okay! I’m okay! So yes, that sense of protection is part of why I was so focused on making sure my daughter knew how to fight. But when I really dig deep -when I’m truly honest with myself as a father -there’s a far more complicated answer. To put it simply, my dreams for my daughter today are different than the ones on the day she was born. Sure, I still want everything for her. I always will. But – and I’m just being honest here – I do want my daughter to learn how to fight. It’s the dream that links every single hero I picked for her. As I now often tell Lila, no matter what stage of life you’re in, when you want something – no matter how impossible it seems – you need to fight for it. When you believe in something, fight for it. And when you see injustice, fight harder than you’ve ever fought before. Consider the story of Marie Curie, who never stopped pushing science forward, even when she was dying from the radiation she was studying. Or the Three Stooges (yes, laugh if you will), who were the first ones to lampoon Adolf Hitler onscreennearly two years before Pearl Harbor. Or the story of Billie Jean King, who challenged (and beat!) the pig-headed man who told her that women were weaker than men. Women are not weaker. It is perhaps the most important lesson I can impart to Lila. Women are not weaker. They are just as strong, just as resolute, just as creative, and are filled with just as much potential as any man. Yes, as her father, my instinct is to protect her (like that first day with the nurses). Other people will want to protect her, too. But she needs to know that she is not a damsel in distress, waiting for some prince to rescue her. Forget the prince. With her brain and her resourcefulness, she can rescue herself. And when she has her doubts – as we all inevitably do – she’ll have this book, full of people who were wracked with just as much fear, but who also found the internal strength to overcome it. From Amelia Earhart to Teddy Roosevelt, to every person I picked, she’ll have the stories of women and men who were no different from any of us. We may put them on pedestals. But no one is born a hero. Like you, like me, they had moments where they were scared and terrified. So how did they achieve what they achieved? Because whatever their dreams were, big or small – for their country, for their family, for themselves – they never stopped fighting for what they loved. We all are who we are – until that moment when we strive for something greater. Is that schmaltzy and naïve? I hope so, because that’s exactly how my mother raised me. That point became even more important three years ago, when my Mom passed away from breast cancer. Then, in the past nine months, I also lost my Dad and my grandmother. It’s been a hell of a year. But rather than mourn them – as I put this book together – I took strength from the fact that the best heroes in my life were the first heroes in my life, beginning with my mother. A few years ago, I went to the headquarters of Borders Books up in Ann Arbor. And when I was there the main buyer for Borders said to me, “Guess where your books sell more than anywhere else? Straight sales, not even per capita.” So of course I said, “New York”—8 million New Yorkers in one city. The number one place my books sold was the Boca Raton Borders, two miles from the furniture store where my mother used to work. That means my mother single-handedly beat 8 million New Yorkers. That was the power of Teri Meltzer. So when it came to finding the final heroes for my daughter, the choice was easy. The second-to-last hero had to be my own mother. I wanted my daughter to know the story of what happened a decade ago, on the day my publisher announced they were shutting down. My second book hadn’t done well, and I thought I was watching my career collapse. So I called my Mom and told her how scared I was. She told me, “I’d love you if you were a garbage man.” It wasn’t a line she had practiced. Those were her honest feelings in that moment. To this day, every day I sit down to write, I say those words to myself, soaking in the purity of my mom’s love. I’d love you if you were a garbage man. My hero. And yes, of course, the very final hero had to be my daughter’s own mother, my wife. That strength, from mother to child, had to continue. No offense to Rosa Parks, or Randy Pausch, or the other heroes I selected – they weren’t nearly as important as the heroes I lived with. Yet for you, dear reader, the most important page in my daughter’s book is the last one – because it’s blank. 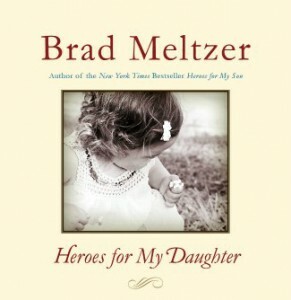 It says “Your Hero’s Photo Here” and “Your Hero’s Story Here.” And I promise, if you take a photo of your mom or grandparent or teacher – and you paste it in the book and write one sentence of what they mean to you – that will be the most beautiful page in Heroes For My Daughter. It will also be the best present we can give our children: the reminder that it is ordinary people who change the world. That’s way stronger than a lesson in throwing uppercuts. Today, my gift is complete. I’ve finished my daughter’s book. The book is my dream for her. And when my daughter has doubts, there is strength in the book. When she’s ready to give up, there’s motivation inside. And when she has questions, there are answers inside, too. But I hope, as the stories of every one of her heroes prove, the best answers will always come from what’s within herself.